Shop Local! Support Your 2013 HandmadeMN Artists! Sept 21, 11 a.m.-5 p.m.
Oct. 6 and 7, 10 a.m. to 5 p.m.
Nov. 16, 10 a.m.-5 p.m.
Graint Belt Brewery Atrium, Mpls. handmade meaningful gemstone and fused glass jewelry. We're kickin' it old school with these Minnesota-made creations. It's that time again! The kids are going back to school, learning new skills and making new friends. Not everything has to be brand new. Vintage and retro are fun too. 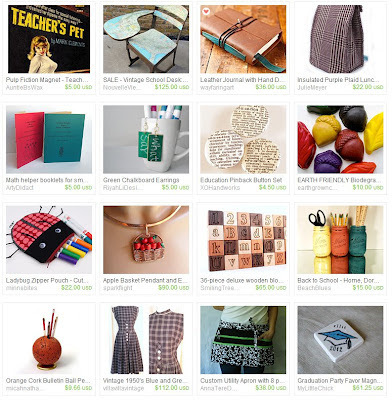 Please visit this treasury featuring Minnesota artists on Etsy. 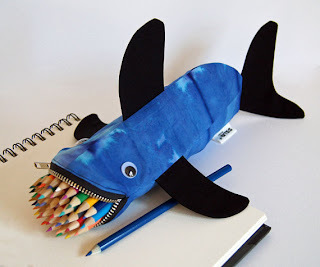 This week's giveaway is from Mary of MinneBITES and is giving away this Tie Dyed Blue Shark Bite pencil case/zipper pouch. Mary created this cute but ferocious shark pencil case/zipper pouch. He has plenty of personality and is ready to eat up all of your favorite pencils and pens. He'll make school fun if you let him devour your school supplies! And he'll bring a smile to your face if you allow him to chomp up all the odds and ends in your bag or backpack. Visit MinneBITES, pick your favorite item and leave a comment on this post about it. (Scroll to bottom of post and click on Comments) Don't forget to include your email address so we have a way to contact the winner! 7. Become a Facebook Fan of minnebites. Comment back here with your Facebook name. Existing fans just leave your Facebook name here. 8. Contest ends Saturday, September 8th, at 12:00 noon Central. One winner will be chosen by Random.org. Fun Friday Finds for State Fair Season! It's State Fair season, folks! What will you find? This week's giveaway is from Aimee of From the Homestead. She is giving away these cute mouse potholders. Wouldn't it be fun to win these two cute little mice to help you in the kitchen? These mice are red with a coordinating red, white, and black print, and little black button eyes. Whether baking or cooking, they'll protect your hands from all those hot pots and pans. They are both cotton on the outside and on the inside there is one layer of Thermolam and one layer of Insul-Bright – two types of batting used in hot pads/pot holders. They are 8 by 8.5 inches with nice long tails that you can use to hang them in a handy spot. Contest ends Saturday, September 1st, at 12:00 noon Central. One winner will be chosen by Random.org. 7. Become a Facebook Fan of From the Homestead. Comment back here with your Facebook name. Existing fans just leave your Facebook name here. 8. Follow Aimee's blog. Leave a comment here letting us know you are a follower. If you are already a follower, leave a comment anyway, as each comment is an entry. Ahhh ... Now that the brutal heat has given way to a gentle late summer mildness here in Minnesota — a chill in the air, even, that proffers a foretaste of fall — sunny afternoons have become lovely and inviting again. A time for late summer picnics, and visits to the park, and leisurely outings on the water, like the sweet little boat trips that Lewis Carroll used to take on the Thames with Alice Liddell and her sisters, which he describes in his epigraph to Alice in Wonderland, and which became the occasions for those eponymous stories that he eventually wrote down for his little friends, and for us, too. Our wanderings to guide. ..."
You can read the full poem here, along with a little context that briefly describes how the stories came about. 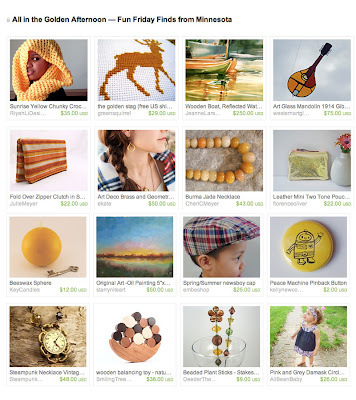 For a collection of handmade objects evoking such golden afternoons, please visit this treasury featuring Minnesota artists on Etsy. This week's giveaway is from Melena Dumala of Snuggle Bug Kidz. 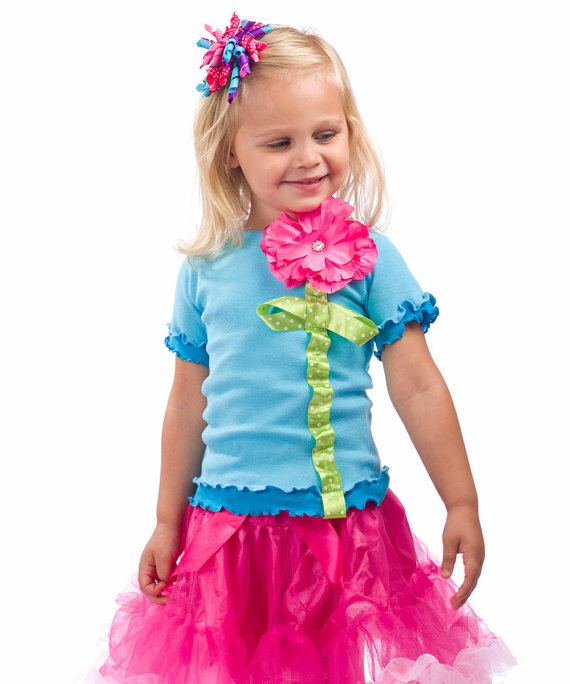 Melena is giving away this precious Girl's Short Sleeve Shirt with an interchangable flower clip. What an adorable top! This Hot Pink and Turquoise Girls T-shirt is Melena's brand new design. Melena has created this top so you can use all of your favorite flower clips and exchange them as the mood strikes. The short sleeve t-shirt has a small sewn pocket opening 1 inch above the stem to attach any flower clip you already have at home... Change up your outfit to be dressed up or dressed down. The Snuggle Bug short sleeve "T" comes with one hand sewn swarovski crystal flower clip, but you can be as fun and creative as you want as you interchange all your own flower clips from home to make a one of a kind outfit. Disclaimer: This is a patent pending product any reproduction of this item will be prosecuted to the fullest extent of the law and reported to Etsy. Open to US & International. Visit Snuggle Bug Kidz, pick your favorite item and leave a comment on this post about it. (Scroll to bottom of post and click on Comments) Don't forget to include your email address so we have a way to contact the winner! 7. Become a Facebook Fan of Snuggle Bug Kidz. Comment back here with your Facebook name. Existing fans just leave your Facebook name here. 9. Follow Melena's blog. Leave a comment here letting us know you are a follower. 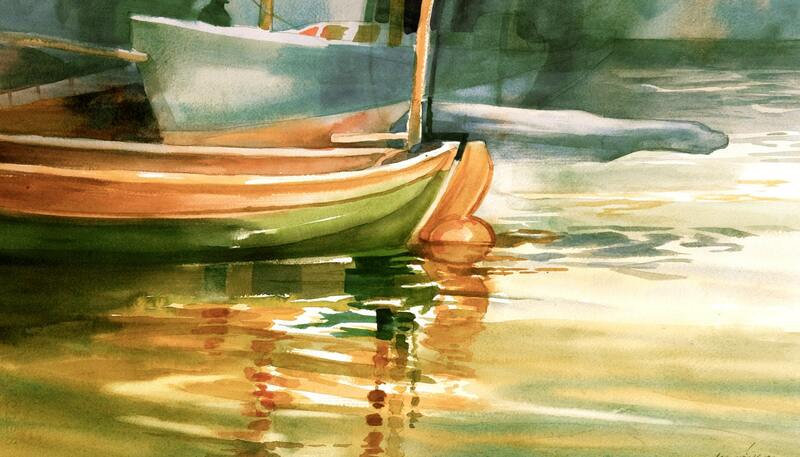 If you are already a follower, leave a comment anyway, as each comment is an entry. 10. Contest ends Saturday, August 25th, at 12:00 noon Central. One winner will be chosen by Random.org. Fun Friday Finds ~ Let's Celebrate!